In the past 10 years, Brazilian keratin treatments (BKTs) have taken the Saudi cosmetic industry by storm, as women aspire to achieve that smooth, shiny, frizz-free, and “healthy” hair. BKT is known by many names such as albumine hair straightening, acetic acid treatment, hair Botox, and many others. The first home-made hair smoothing formulations contained keratin and toxic amounts of formaldehyde (37%); the health vigilance organizations in Brazil (ANVISA) prohibit cosmetic hair products containing >0.2% of formaldehyde concentration. Subsequently, formaldehyde in the preparations was replaced by neurotoxic, mutagenic glutaraldehyde. Regardless, the product was widely sold and used in Brazilian salons, carrying a false ANVISA registration number. In a 2013 cross-sectional study on formaldehyde levels in Brazilian keratin straightening treatments, six out of the seven tested products had a formaldehyde level ranging from 0.96% to 1.4%; 5 of these products were labeled “formaldehyde-free.” More recently, in 2016, the Saudi Food and Drug Authority published a warning article on four products found in local markets containing high levels of formaldehyde, exceeding the permissible percentages. There are many keratin hair treatments products currently in the market, all having the same mechanism. The hair is blown-dry to break the hydrogen bonds of the hair keratin, allowing hydrolyzed keratin to penetrate the hair and crosslink with the natural hair keratin. Facilitated by a crosslinking agent (formaldehyde, it derivative formalin or methylene glycol) and flat iron. The World Health Organization, International Agency for Research on Cancer, United States Environmental Protection Agency, and Oregon Occupational Safety and Health Division all classify formaldehyde as a carcinogen, particularly in the nasal cavity. Coughing, wheezing, eye irritation, contact dermatitis, and other allergic reactions can be seen on short-term exposure. The public's awareness of these potential adverse exposures is not well characterized. The study's goal is to measure females' knowledge and attitudes toward these widely used products. This is a quantitative cross-sectional study conducted from November 2017 to February 2018 in Saudi Arabia, following the Helsinki Declaration and approved by the Research and Ethical Committee at Princess Nourah Bint Abdulrahman University. It includes 1039 female participants aged 18 and above and consent was taken verbally– with the exception of 2 underage participants where guardians' verbal consent was attained. Based on 50% prevalence and 95% confidence interval, the calculated sample was 400 but increased to 1000 to compensate for incomplete data. Data privacy was insured, participation was voluntary, and instructions were given regarding the questionnaire. The questionnaire included 24 close-ended questions formulated based on the published literature. It was translated into Arabic and checked by an Arabic linguistic expert for accuracy. Questions included demographics, hair treatments knowledge, previous experiences, and observed side effects. A total of 496 participants answered a self-administered questionnaire, distributed to Princess Nourah Bint Abdulrahman University and King Abdulaziz university students, health care workers and people in waiting areas at King Fahad Medical City and Prince Sultan Military Medical City, family, friends, and neighbors. Five hundred and forty-three participants answered the online survey formulated by Google forms. The data were coded and analyzed using SSPS version 2, and descriptive statistics were used to describe the study sample. P < 0.05 were considered statistically significant. Of the 1039 females who agreed to participate in this study, 496 answered a self-administered questionnaire (47.7%), and 543 answered an online questionnaire (52.3%). 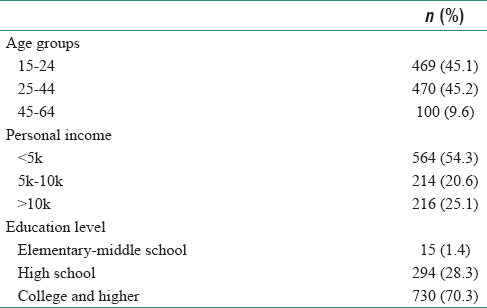 The ages ranged between 15 and 64 with a mean age of 29.7 ± 10.2 with the majority (70.3%) being of college or high educational level [Table 1] and [Table 2]. About 60% of participants had a poor knowledge score regarding hair treatments [Table 3]. When asked if formaldehyde is a carcinogen, 24.4% answered correctly, 70.5% did not know, and the remaining (5.1%) answered incorrectly. About 33.5% of the participants have had hair treatments done previously. 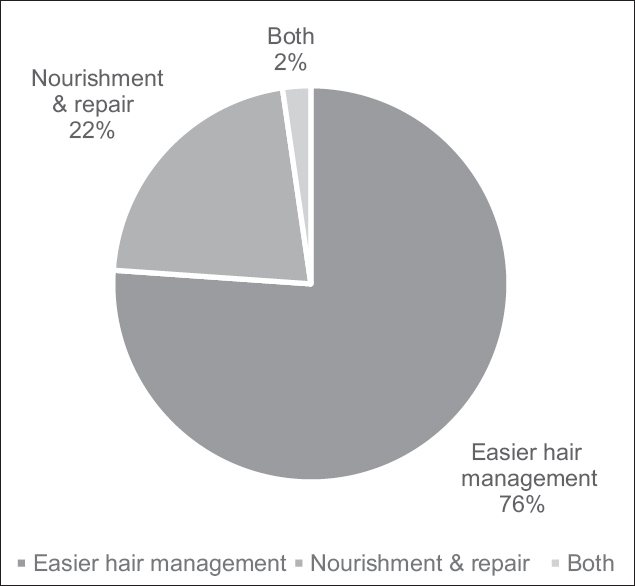 When asked why, 76.1% answered to facilitate hair management, 21.6% for nourishment and repair, and the other 2.3% for both purposes [Figure 1]. However, 52.3% of respondents did not read about hair treatments before their use, 57.5% said that their hair was not tested or examined before the treatment, and 31% applied scalp barriers during the treatment. Flat irons were used in 83.6% of cases. About 30.2% of the participants did not go to a salon and applied the treatment by themselves at home. Nearly 55.2% did not know if the product they used contains formaldehyde or not. Only 29.6% used “formaldehyde-free” labeled products. Moreover, the remaining 15.2% used formaldehyde-containing products knowingly. Nonetheless, there was no association between the type of product used and the reported side effects (P > 0.05). About 74.7% of women who used hair treatment had experienced the sides effects [Figure 2]. When asked if they would consider trying hair treatments again, 61.2% answered no, with damage and side effects being the major reason (90.6%). The other 9.4% were not using the treatment again because of unsatisfactory results. Hair smoothing treatments, often called Brazilian keratin treatments, are now widely used by the majority of the female community in Saudi Arabia and worldwide. This study is considered to be the first study assessing the knowledge and attitude toward using hair smoothing treatments. Our study showed high poor knowledge prevalence despite the respondents' educational background, age and in an era where social media and the internet are easily accessible by the community and used in searching about products, ingredients, and medical information. 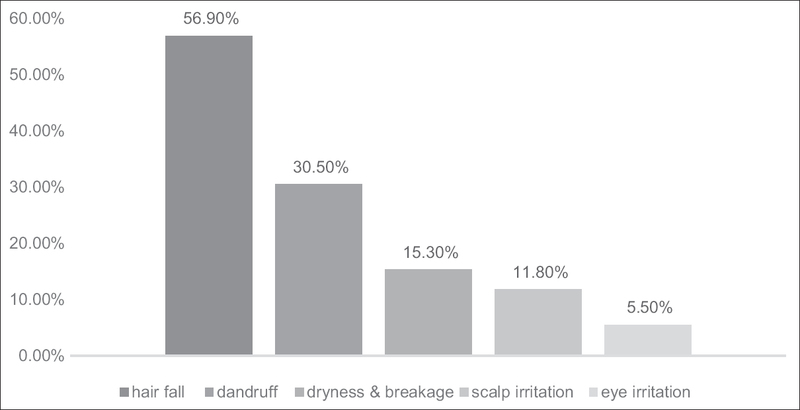 Regarding minimizing reported side effects [Figure 2] safety measures should be advised to hair salon workers and enforced by the ministry of health, for example, scalp irritation can be avoided by applying scalp barriers before applying the product, and our study showed that only one-third of the participants had scalp barrier applied. Furthermore, eye shields can be considered as a way to minimize eye irritation. Because of the side effects reported, more than half of respondents chose not to do it again, which shows the extent of harm that these products can cause and the need to educate the public, seeing that despite these unwanted side effects, women are willing to use them again. Surprisingly, our study reports that 30.2% of women were able to buy the smoothing product from beauty stores and pharmacies and apply it at home either by themselves of someone else, exposing them to greater risks such as respiratory tract irritation. It is worth mentioning that more than half of our participants were not aware if the product used contained formaldehyde or not, this could be explained by the fact that most of them did not have the knowledge about its carcinogenic nature. The limitations of this study include the majority of participants being from the central region of Saudi Arabia and the limited older age group (9.6%). This study gives a starting point for future studies, which should include more participants from other regions and expand the age of participants to include older women. Another major limitation was the lack of prior similar studies, which would have helped us identify the influential factors of knowledge and attitudes by comparing the results of different studies. This study shows the lack of industrial supervision and consumers' protection and the need for strict monitoring regimens in stores and beauty salons. Furthermore, future studies should be applied in assessing the public's misconceptions and practices, along with campaigns and social media efforts to raise the overall knowledge of the general public. Maneli MH, Smith P, Khumalo NP. Elevated formaldehyde concentration in “Brazilian keratin type” hair-straightening products: A cross-sectional study. J Am Acad Dermatol 2014;70:276-80. SFDA Warns of Using 4 Keratin Hair Straightener Products, as they contain high percentage of Formaldehyde; 2016. Available from: https://www.sfda.gov.sa/en/drug/news/pages/drug22-11-2016a1.aspx. [Last accessed on 2017 Oct 06]. Formaldehyde; 2002. Available from: http://www.who.int/ipcs/publications/cicad/en/cicad40.pdf?ua=1. [Last accessed on 2017 Oct 05]. Facts about Formaldehyde | US EPA. Available from: https://www.epa.gov/formaldehyde/facts-about-formaldehyde#whatare. [Last accessed on 2017 Oct 06]. Hair Smoothing Products and Formaldehyde; 2010. Available from: http://www.osha.oregon.gov/OSHAPubs/hazard/2993-26.pdf. [Last accessed on 2017 Oct 04].